Are you ready for your world to be rocked by some granola? Yes, I know what I just said. It's possible that I'm delusional here but this is some good stuff and I love food. Especially yummy holiday food. And when said food starts making my house smell like Christmas all reason goes out the window. So yes, I believe this granola will rock your world (or at least your kitchen). I've been plotting away at this recipe for quite some time. I knew I wanted to make a holiday inspired granola since it makes such a great gift but I tossed around lots of flavor ideas- pumpkin, peppermint, chocolate. Then someone mentioned a gingerbread latte the other day and I knew I needed a gingerbread latte in granola form! So here it is, my next bundle of goodness in my homemade gift series (if you missed my other gifting posts you can check them out here and here). This stuff is so good, you'll want to make extra so you don't eat everyone's gift! While I call it granola, you can also eat it as a cereal or just pour it into your mouth strait from the jar (no one has been seen doing this at my house- I swear). It's also fabulous straight out of the dehydrator when it's still warm. If you're not in the holiday spirit yet, whip up a batch of this amazing stuff and enjoy the smell and taste of gingerbread! Oh, did I mention that this stuff is a nutritional powerhouse? It's grain free (buckwheat is actually a seed) and full of healthy fats! And did you know blackstrap molasses is a great source of iron? We actually give the kids a spoonful each night to give them a little boost in iron! So get gifting and enjoy some granola love! Soak almonds and walnuts for 8 hours. Soak buckwheat groats for 1 hour. In a small bowl, combine molasses, honey, water and vanilla and mix to combine. In a small food processor, pulse pumpkin seeds for a few seconds. You want them partially ground with some chunks. Remove from processor and add to a large mixing bowl. Add chia seed to the processor and pulse until ground. Add chia meal and remaining ingredients to your large bowl. Mix well and enjoy the smell of all of that yumminess. Rinse nuts and buckwheat well and add to bowl. Mix again until the nuts are coated with the dry ingredients. Next pour the molasses mixture on. Mix everything together again. It should be a nice gooey brown mess. Spread on 2-3 dehydrator trays. The mixture should be an even thickness over the whole tray. Dehydrate at 115 degrees for 6-8 hours or until you are able to flip easily. Flip granola and allow to dehydrate until fully dry, about 6 more hours. *Dehydration times vary greatly between dehydrators and depending on how wet the nuts are when added. Keep an eye on the granola the first time you make it so it completely dries out! Don't worry if you have to do a taste test- for the sake of quality right? If you're gifting, fill up a jar and add a pretty bow. And there you've got an easy, inexpensive gift, filled with all the love of your kitchen! 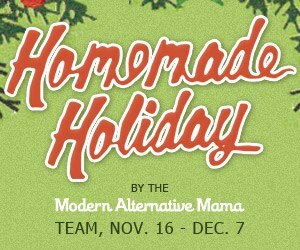 This post is part of the Homemade Holidays Gift Roundup from the Modern Alternative Mama Team. To see more awesome real food gift ideas, click on the button below! This post is shared at Keep It Real Thursdays, Simple Lives Thursday, Pennywise Platter Thursday, Fight Back Friday, Farm Girl Friday, Gluten Free Friday, Foodie Friends Friday, Monday Mania, Meatless Monday and Homestead Barn Hop. This looks delicious! Thank you for sharing your recipe on Foodie Friends Friday Linky Party! I soak them in plain filtered water. You can use your oven, just put it on the lowest possible setting- maybe even crack the oven door. I'm not sure how long it will take to dry so keep an eye on it! Mmmm! This would make great gifts! leaving them whole should be fine :) You want to soak your nuts for as long as possible to decrease the phytic acid and also to make them wet and soft to dehydrate. If you can't do 8, I recommend at least 5 hours.